I have something to write about Christopher Nolan, but that involves some "TDKR" spoilers - if you haven't seen the movie yet, scroll down for the recipe. Many of the people I have talked with about "TDKR" think that Nolan should return for another Batman movie, especially because of the way "TDKR" ended, but I disagree ; As much as I love the three films he superbly directed - and you know I am a fanatic for his trilogy - I believe that it is a cycle that ended beautifully and now it's time for him to move on as a director. That is very clear to me when I think of the amazing films he has made aside from the Batman trilogy - he even made me like Robin Williams! - and I would be absolutely thrilled to watch more films like the fantastic "The Prestige" . 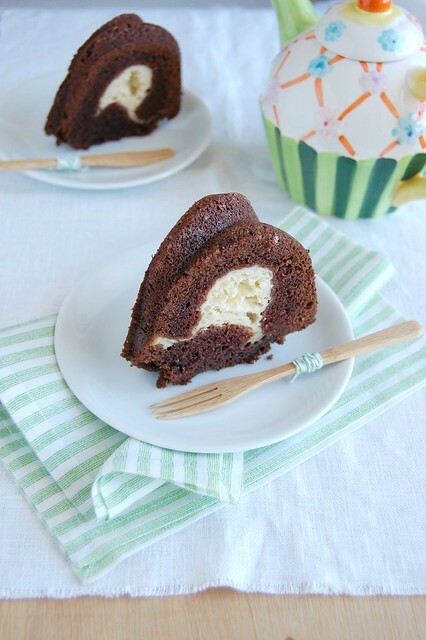 I love the idea of a cake that comes out of the pan already filled, and for someone who adores cheesecake like I do this chocolate cake is just perfect. Preheat oven to 180°C/350°F. Butter and flour a 12-cup capacity Bundt pan . Cheesecake swirl: in a medium bowl, mix together the cream the cheese, sugar and vanilla with a whisk until creamy and smooth. Beat in the egg. Set aside. Cake: in the large bowl of an electric mixer, using the paddle attachment, beat the eggs, sugar, oil and vanilla until thick and smooth. In another bowl, stir together the flour, cocoa, baking soda and salt. Add the dry ingredients to the egg mixture alternately with the buttermilk and beat until smooth. Spoon 2/3 of the chocolate batter into prepared pan. Using the back of a spoon, make a trough in the batter, all the way around the pan. Carefully spoon the cheese mixture into the trough. Gently cover the filling with the remaining chocolate batter and smooth the top. Bake for 60-70 minutes or until a toothpick inserted in center comes out clean. Let cool in the pan, over a wire rack, for 15 minutes, then turn onto the rack. Cool completely before serving. I love the swirl, perfection! This recipe is splendid, I also like the cakes that is already filled, and of course is not only a flavor thing, it's also a visual effect...!!! The cake looks delicious. I am adding it to my to do list. I remember this cake! A group of my baking friends have baked this cheese swirled chocolate cake in a baking group called The Home Baker. I so want to make this. Bookmarked! Thanks for sharing a lovely recipe. This cake is really good. And I hope you did not mind me saying that about the recipe, just wanted you to know the correct source. Sailaja, I hope you try it! The Cheesecake swirled chocolate cake look so fresh on the pancake. Hey, Hillary, sure, no problem! Banana streusel muffins + "Skyfall"